Description Finally here it is. 2 way map with a bit of a twist. Please suggest improvements and alert me to any bugs you find. - Both Occulders pointed out have been removed. - Fixed a tone of issues. Hopefully works fine now. - Worker paths working well. 06.11.2009, 04:00 I have not had he chance to download and test, but in the mid section colored brown, are the two mid stone mines on the same level and within seeing distance? 06.11.2009, 09:27 The middle has 2 grimps walls and a bridge which can be passed by smaller units. Looking over the walls you can see the other mines. 10.11.2009, 22:37 are you supposed to be able to climb on the mountains anywhere? up near one of the far corners mines there is a hut3 that a person can use to easily up on the mountain. 11.11.2009, 08:15 No, mountains are supposed to be blocked off. Should be fixed now. 18.11.2009, 03:28 Awesome looking map, good work. 18.11.2009, 05:46 I think a new minimap would do this map great justice. Something richly textured, the current one is a little blurry and the textures are blotchy. 18.11.2009, 10:04 Two Grims walls are there to be destroyed. It lets Players from the middle jump down onto the other path. If you believe it will harm gameplay I will remove them. 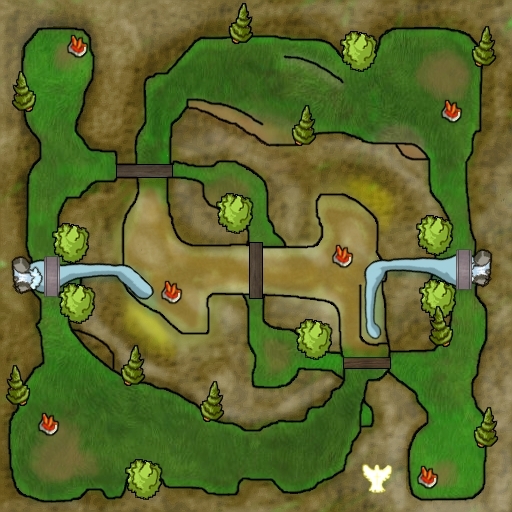 I enhanced the original minimap a bit. Its too much work to redraw the whole thing. 18.11.2009, 13:36 I'll give it a worker pathing/exploit test then. I'll add it to the mappack too. 01.12.2015, 17:53 Creative, but kinda biased towards beast.